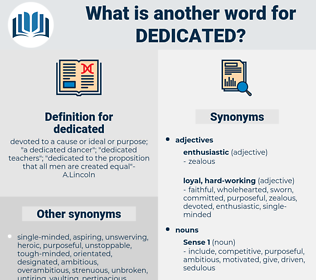 What is another word for dedicated? committed, intended, allocated, assigned, determined, special-purpose, allotted, wholehearted, application-specific, enthusiastic, restricted, affected, single-minded, attached, exclusively, established, selfless, involved, full-time, motivated, focussed, ardent, trained, faithful, dutiful, appointed, active, sincere, commitment, reserved, hardworking, tailored, passionate, impacted, whole-hearted, tireless, responsible, obedient, customized, allocate, fine-grained. donated, commemorate, Inaugurated, initiated, devotion, Attributed, Contributed, detected, acknowledged, mandated, appropriated, specialise, attended, Deployed, directed, adapted, Introduced, addressed, apportioned, credited, utilized, specifically, instructed, classified, Broadened, contained, Saddened, sanctions, Erected, discovered, Aimed, guaranteed, purpose, retained, Examined, consumed, Dealt, included, endorsed, confirmed, empowered, Discussed, recognized, conferred, Watched, Upheld, reflected, committed, Dampened, Tasked, Influenced, opened, paid, used, Provided, represented, employed, sent, occupied, effected, presented, Awarded, commissioned, Ushered, conducted, moved, needed, Volunteered, Shifted, Referred, featured, enrolled, Worked, Gave, struck, Pioneered, Launched, Took, ordered, observed, geared, Carried, Became, held, proved, produced, centred, monitored, charged, Allowed, Happened, trusted, goal, Served, spotted, Accounted, posted, booked, Passed, Asked, Looked, Went, requested, based, Meant, made, intended, allocated, assigned, allotted, restricted, affected, established, involved, focussed, specialised, appointed, reserved, impacted, responsible. incorporated, dictated, Participated, Accommodated, cultivated, donated, demonstrated, orientated, reallocated, Extradited, Inaugurated, initiated, Indicated, implicated, characterized, articulated, terminated, written, Debated, determination, relocated, Attributed, anticipated, Enunciated, Investigated, located, Enumerated, calculated, declared, decided, Contributed, withdrawn, distributed, pedestrianised, confined, diverted, mandate, Created, acknowledged, Communicated, mandated, implemented, commited, appropriated, accepted, wasted, described, ascertained, dominated, completed, preferred, constituted, destiny, attended, Injected, Translated, Deployed, obligated, directed, Enacted, Administered, entrenched, deepened, afflicted, Slated, adapted, Introduced, Delivered, emphasised, formulated, financed, considered, condemned, Generated, addressed, apportioned, regulated, Operated, destined, Deemed, altered, intensified, Ascribed, credited, Undertaken, Instituted, utilized, withheld, Tackled, reassigned, rectified, Devised, Deposited, inscribed, utilised, expended, collected, Recruited, instructed, classified, dispatched, stated, authorised, target, pledged, composed, disposed, Rendered, formalized, tied, lent, contained, derived, enlisted, converted, encouraged, constrained, exploited, sworn, embedded, sanctioned, Embraced, corrected, Promoted, jeopardised, connected, published, Striven, reinforced, Issued, Jeopardized, extended, hired, manufactured, Mobilized, fastened, Aimed, inverted, Disbursed, recorded, Anointed, desired, Resources, guaranteed, impaired, organized, Consigned, objective, Convened, concluded, Channelled, Avoided, Submitted, centered, endeavoured, Embarked, Afforded, entitled, retained, Examined, multiplied, inspired, added, Assessed, consumed, recognised, Incurred, transmitted, started, wedded, divided, Entailed, predicted, Dealt, included, Captured, governed, endorsed, Remitted, treated, embodied, confirmed, Exerted, unveiled, empowered, bound, Discussed, agreed, watch, handled, laid, titled, recognized, filled, supported, Remedied, Upheld, Begun, reflected, Hindered, safeguarded, committed, budgeted, guarded, Bolstered, favour, Forwarded, chosen, received, Tasked, Urged, outlined, turned, Stationed, outposted, elapsed, redeployed, obliged, surrendered, reported, prolonged, Appealed, liquefied, Yielded, encumbered, honoured, cleared, Influenced, opened, led, paid, absorbed, aligned, Compared, recovered, used, Provided, Efforts, occupy, employed, left, sent, Been, disrupted, occupied, effected, presented, Awarded, Filed, seized, commissioned, Waged, pursued, prepared, raised, Ushered, solved, promised, conducted, covered, psyched, permitted, handed, built, search, moved, drawn, guided, imposed, projected, headed, staffed, favourable, Taxed, paved, needed, weighted, damaged, leased, mobilised, contracted, plagued, Suffered, joined, Bred, given, Shifted, Referred, featured, undermined, Fought, L, expected, Worked, HIT, Tendered, touched, Borne, Subjected, Followed, struck, lost, taken, measured, CODED, Launched, overcome, expressed, sealed, Anchored, ordered, prejudiced, Accorded, Levelled, geared, Carried, found, linked, Espoused, Reached, leveraged, planted, clocked, proven, Returned, attempted, forecast, Grounded, called, Entered, Brought, seeded, held, proved, produced, autographed, Strapped, foreseen, preserved, centred, harmed, charged, Performed, ruled, reversed, sold, Exported, Allowed, funded, shaped, Compromised, Acted, Happened, Offered, trusted, supposed, goal, poised, fenced, Had, sought, played, suited, revered, Supplied, processed, marked, signed, placed, Shipped, Served, Accounted, founded, Occurred, Poured, rooted, Prompted, posted, booked, Passed, grown, worried, Shown, dropped, Logged, planned, ensured, Asked, released, tried, gone, formed, programmed, requested, kept, mission, sorted, based, shed, Meant, figured, made, done, intended, allocated, assigned, determined, allotted, restricted, affected, attached, established, involved, motivated, focussed, trained, specialised, appointed, reserved, tailored, impacted, responsible, customized. dedicate, conscientious, specialized, loyal, proprietary, specialised, hard-working, professional. lazy, disloyal, unenthusiastic, apathetic, lethargic, indifferent, inconstant, unfaithful. wavering, hesitant, dubious, untrustworthy, recreant, dispassionate, unreliable, faltering, vacillating, uninterested, uncertain, irresponsible, undependable, shaky, irresolute. Kirby produced the pail dedicated to the preparation of coffee. It came to be recognised on Selina's part that nature had dedicated her more to the relief of old women than to that of young men. dished, dedicate, die-cast, decade, deist, decode, dictate, dakoity, decayed, deject, dish out, dioxide, discoid, diazoxide, deduct, dissuade, dakoit, dicky-seat, docket, decided, do good, diseased, dziggetai, dacoity, decked, desiccate, decussate, dagda, disassociate, desuetude, dugout, deck out, dashed, decidua, dictated, detected, dickhead, dogtooth, digitate, detested, dazed, degust, death seat, dead set, duck shot, dogged, dodge city, dasyatidae, dytiscidae, do-si-do, deuced, dogwood, detect, desiccated, digested, due west, disgusted, dig out, dighted, detoxicate, ducat, dissect, diskette, dosed, destitute, dickie-seat, deceased, death's head, disquieted, digit, due east, deceit, dust, dicot, duckweed, decoct, dacoit, dusty, disquietude, disused, dejected, De Sade, dockside, doughty, dickey-seat, desist, digest, death squad, dacite, duct, detached, dissociate, dead weight, decide, dog-sized, decked out, dissected, disguised, dakota, disgust, due south, disquiet, detest.